The information below is intended to be used as a guide ONLY and specifically tailored for Building Class 1 & 10. If you are constructing a staircase in Class 2-9 Building, other regulations suiting your class of building may be required. If you require information regarding any staircase or balustrade regulation for any Class Building please contact our helpful sales staff. When designing your staircase you will need to follow the current Building Code of Australia. Staircases and Balustrades for use externally or between habitable rooms in residential buildings 1&10 can be found in section 3.9.1 Stair Construction and 3.9.2 Balustrades. Other references to staircase construction can be found in the Australian Standard AS1657 Section 4 – Stairways. Below is an overview of this information to help you design your staircase to suit these regulations. General Requirements – Staircase used in habitable rooms or used externally must comply with the Building Code of Australia Part 3.9.1. All areas not specified in Building Code of Australia should be referenced in the Australian Standard AS1657 Section 4. Staircases to storage areas or un-habitable rooms such as attics can be constructed outside the Building Code of Australia though must comply too the Australian Standards AS 1657. Your staircase must have no less than 2 risers or have no more than 18 risers without a 750mm2 landing or rest area. Each tread and riser must be of the same measurement within a single flight. The riser opening if your staircase is of Open Rise Construction must not allow a 125mm sphere to pass through. All treads and top nosing must have a slip-resistant finish or a non-slip strip system near the edge of each tread nosing. A flight must not have more than 3 winders in a quarter landing section or 6 winders in a half landing section. If a door in your home opens onto a staircase a landing is required unless the floor to floor dimension is less than 570mm. If the floor to floor is less than 570mm all that is required is a zero tread. Stairways shall be not less than 600 mm wide measured between the inside edges of the handrails. The angle of pitch of a staircase shall be not less than 26.5 degrees and not greater than 45 degrees. Your staircase must have no more than 18 risers without a 750mm2 landing or rest area. The staircase should have no more than 36 rises without a change of direction. 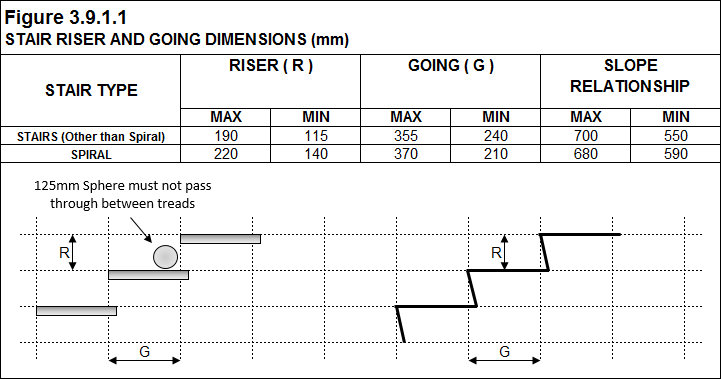 Unless otherwise approved by the regulatory authority, the head clearance shall be not less than 2000 mm measured vertically from the nosing line. All rises and all goings, in the same flight of stairs shall be of uniform dimensions within a tolerance of ± 5 mm. A balustrade is required to any staircase, balcony, ramp, hallway, veranda, mezzanine or bridge were the potential to fall from the above mentioned area is 1000mm or greater to the surface below. The height of the balustrade on the pitch of the staircase must be not less than 865mm form the nosing line. This dimension is taken plump from the nosing line with the rail or balustrade running parallel up the pitch of the staircase. The height of the balustrade on a finished floor, balcony, landing or path must me above 1000mm. 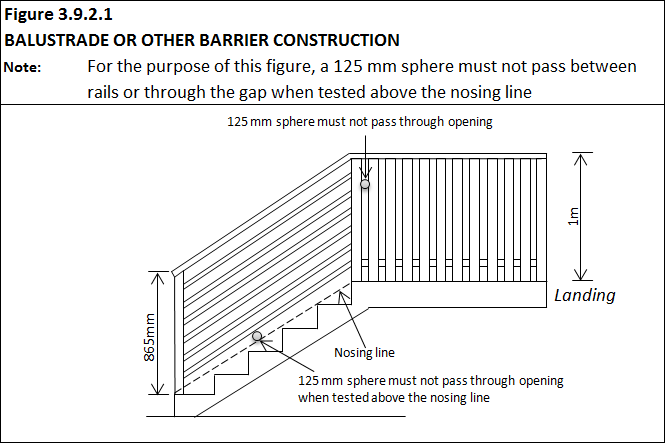 Openings in the balustrades must be constructed so that any opening does not permit a 125mm sphere to pass through it. This space is tested above the nosing line only. With floors or balconies were potential to fall more than 4000mm to the surface below, all horizontal elements between 150mm and 760mm above the floor or balcony must not facilitate climbing. Any staircase or balustrade to a storage area or un-habitable rooms must comply too all other regulations above apart from NCC Part 3.9.1.2. The Staircase rise and goings for an un-habitable room must be constructed in accordance with AS 1657 – 4.2.1. Each rise shall be not less than 130 mm and not greater than 225 mm. Each going shall be not less than 215 mm and not greater than 335 mm. The product of the going, measured in millimetres, and the rise, measured in millimetres, shall be not less than 45 000 and not greater than 48 000. Every reasonable effort is made to ensure that the information provided on this website is accurate, however no guarantees for the currency or accuracy of information are made. OzStair’s website and material relating to information, products and services (or to third party information, products and services), is provided ‘as is’.